Contact Miami-Dade County, Florida Personal Injury Attorney Gerson & Schwartz, P.A. Florida is the most dangerous state in the nation for bicycle accidents. In 2011, bicycle accidents in Florida claimed 125 lives – accounting for 1 in 6 cycling fatalities nationwide, according to the National Highway Traffic Safety Administration. As state and local officials continue to emphasize cycling as recreation and a means to reduce congestion, it’s vital that the proper infrastructure be in place to accommodate the influx of new riders. The attorneys at Gerson & Schwartz P.A., serve Broward and Miami-Dade counties, and are dedicated to winning justice for cycling accident victims and their families. If you or a loved one has been injured in a bicycle accident in the Miami-Fort Lauderdale area, call today for a free and confidential consultation to discuss your rights. Both Miami Beach and Broward County have launched bike share programs in recent years, patterned after a bike rental program in New York City. Tourists and residents make more than a million trips a year on the rented bicycles. Miami and Orlando were launching programs at the end of 2013. And throughout South Florida, expansion of bike paths is a top priority. In September 2013, U.S. Department of Transportation Secretary Anthony Foxx announced more than $10 million in funding for cycling infrastructure in Southwest Florida. The increasing popularity of cycling for both recreation and fitness has changed the demographics of those most at risk of serious and fatal injuries. Today, middle-aged men are most likely to be seriously injured or killed in a cycling accident. In fact, federal statistics show the average age of an accident victim is on the rise. 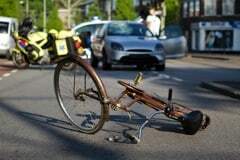 In the last decade, the average age of a cyclist killed has increased from 36 to 40, while the average age of a cyclist injured as increased from 28 to 32. Riders ages 45-54 have the highest fatality rate. In many cases, the accident victim is a family’s primary wage earner, adding to the emotional and financial consequences. This type of accidents accounted for 125 of the nation’s 677 fatalities in 2011. On a per-capita basis, Floridians are more than twice as likely to be killed in a cycling accident than a rider in any other state. About 20 riders a year are killed in Broward and Miami-Dade counties, according to the Florida Department of Highway Safety and Motor Vehicles. Nationwide, another 50,000 riders are injured. Too often, cycling accidents in Florida result in very serious injuries, including broken bones, crush and amputation injuries and traumatic brain injuries. Whether you are engaging in a bike race, marathon or merely biking in South Florida for leisure purposes accidents happen. Although some accidents are simply that, accidents, others could have been prevented had it not been for the negligence of another party. Bicycles are commonly ridden along the right edge or shoulder of the road. Motorists often don’t notice bicycles and when they do little regard is shown for their equal rights to use the streets and roadways. Since 1970, the Florida accident attorneys Gerson & Schwartz, PA has pursued personal injury and wrongful death claims for clients injured in bicycle accidents throughout Miami Dade, Coral Gables, North Miami Beach and other portions of South Florida. Many people are surprised to learn that bicycle accident victims, and even pedestrians injured by a motor vehicle, are entitled to recover insurance benefits for personal injuries under their own auto insurance policies. Auto insurance coverage may also be available for children involved in bicycle accidents, or those who are injured by vehicles under their parent's car insurance policies. Insurance proceeds can be used to pay for medical bills and pain and suffering. Our Miami bicycle accident lawyers understand Florida motor vehicle accident laws, insurance policies, and how the applicable law may apply to your case. You should know that Florida law provides bicyclists the same legal protections applicable to motor vehicles. Likewise, cyclists must follow the same rules of the road. Statistics provided by the National Highway Traffic Safety Administration show that between 2000 and 2009, traffic crashes claimed the lives of a total of 7,053 pedalcyclists. The NHTSA defines pedalcyclists as “riders of two-wheeled non motorized vehicles, tricycles, and unicycles powered solely by pedals.” Traffic data also suggests that, while there is oftem more emphasis on safety during nighttime bike rides, 72 percent of the bicyclists and other cyclists who were killed in 2009 (630 individuals, or 1.9 percent of the traffic fatalities recorded nationwide) lost their lives in wrecks that occurred between 4 a.m. and 8 p.m. According to the Center for Disease Control and Prevention (CDC) more than 500,000 bike accident victims are admitted into the ER to be treated for their injuries on an annual basis. Statistical data also indicated that kids no more than 15 years old make up more than half (59 percent) of all bike accident-related emergency department visits. Dawn and dusk are the most dangerous times to ride. Rising and falling sun makes motorist vision difficult and minimizes the effectiveness of cyclist safety measures to be conspicuous. Avoid riding during these hours if possible unless dedicated bike paths are available. Headlights, red reflectors, light colored clothing, are a must to make riders as noticeable as possible. All bicycles should have rear view mirrors and loud audible horns to enable operators to ride defensively. Riding in groups, the larger the better, contribute to motorist awareness of riders. Always yield to vehicles even if the road rules give the bicyclist the right of way; it’s a mismatch for any cyclist in contact with a multi-ton vehicle. Helmets and protective clothing sometimes mitigate injury severity. Bicycle design defects or manufacturing mistakes to frame, wheels, pedals and seats. These are just some basics we have seen from experience. Avoid high-speed traffic and ride defensively. In the event of a serious injury preserve the bicycle and other physical evidence, which can be useful for accident reconstruction to establish motorist liability for negligence by a qualified personal injury attorney. If you or a loved one has been seriously injured in a bicycle accident that resulted from the negligence of another party, the Miami, Florida based personal injury attorneys of Gerson & Schwartz, PA are here to help. For more information on how we can help, or to schedule a free case consultation with a Miami accident attorney today, call us at (305) 371-6000 or contact us online.